Anne Healy leads Development Innovation Ventures, USAID’s tiered, evidence-based innovation fund focusing on sourcing, testing, and scaling innovations in global development with high potential for impact, cost-effectiveness, and scale. She has worked across the private, public and social sectors on evidence and innovation in government and international development. As a consultant at McKinsey & Co., she advised Fortune 500 companies, federal and state government entities, multilateral organizations, and philanthropies on strategy, organizational change, and operations, with a focus on economic development and crisis response and recovery. 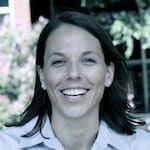 Healy was part of the senior leadership team that established the Innovations for Poverty Action operation in Kenya, where she also oversaw randomized controlled trials in the water and sanitation sector with leading development economists from Harvard and Berkeley. Most recently, as senior advisor at the State Department, Healy advised Deputy Secretary Heather Higginbottom on global health security and innovation in Department operations and management. She has a J.D. and a Master in Public Administration in International Development (MPA/ID) from Harvard and a B.A. from Princeton.